Our business has received hundreds of two-way radio service calls over the years. While it is often necessary to consult a two-way radio service provider to resolve these issues, there are many problems that can be solved just by taking steps to diagnose and trouble shoot. And there are many maintenance routines that prevent these issues from occurring in the first place. 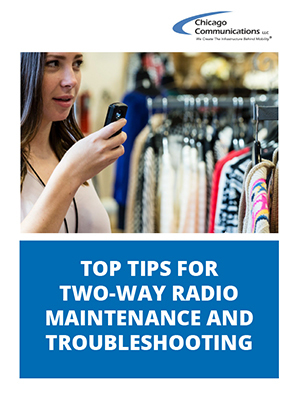 On this page, we describe the most common problems that users face with two-way radios, and the steps you can take to trouble shoot and prevent them. Is It Your Radio or Your System? Inconsistent and poor sound quality across multiple units within the same area may be a sign that the system is contributing to the problem. In this case, make sure to contact your two-way radio service provider to have the issue diagnosed and addressed. Does it PTT (Push To Talk)? For mobile radios: Check under the hood using a volt meter: Do you have 12 volts of power? Do you have ground power? Is everything connected and does equipment look intact? For mobile radios: Is the antenna tightened to the roof of the vehicle? Is it connected to radio? Is the path clear from contacts to the antenna? Is the area under the antenna whip free of corrosion? Is the radio on the proper channel? Are all employees using the correct channels when contacting each other? Is the speaker connected to the radio? Is the battery fully charged? You can check battery life in the field with a volt meter. Is the battery on correctly and tightly? Is the battery expired? Check the date. For reference purposes, the detailed steps below refer to the parts, features, and functions of the Motorola CP200d and XPR3500 portable radio. For helpful visuals and more details, check out the step-by-step video below. Radios can malfunction if the antenna is loose, or if it's the wrong type, or installed incorrectly. Start by removing the antenna by turning in a counterclockwise direction. Look to ensure you have the correct antenna type for your radio — the standard whip antenna, which is long and thin, or the stubby antenna, which is much shorter. The antenna will have either a pin or a flat connector; look at the connector base on the radio and make sure it's the correct shape to fit the connector, pin or flat. Also look at the antenna and see whether it has "UHF" or "VHF printed on it. Look at the model number on the radio label, and check the documentation for that radio to see if you should be using it on the UHF or VHF frequency band; make sure you have the appropriate type of antenna for that frequency band. If you appear to have the correct type of antenna, reinstall it by turning it in a clockwise direction and turn the radio back on. Replacing your two-way radio batteries often solves the problem. These batteries usually last between 18 and 24 months depending on the amount of usage. You can check the manufacturer's date of your battery by first removing it from the radio and checking the four digit number located on the back of the battery next to the bar code; the first two numbers indicate the year and the second two numbers indicate the week. If the batter is over 24 months old, replace it. If your radio has a display screen, you can check its battery life as indicated on the top left corner of the screen. If there's no display, when turning on the radio, you can listen for a double beep being emitted from the radio. This is the indicator of a low battery. You can also check the LED light indicator on the radio's charger. If your radio doesn't seem to be turning on, place it securely in the charger, making sure the contacts of the battery align with the contacts of the charger. Look at the LED light and note what colors are displaying and in what pattern. Check this against the documentation provided with your radio to see what issue is occurring; the video above includes the indicator light chart for the Motorola CP200d and XPR3500. For example, if the light flashes between red and green, the battery's reaching the end of its live. It can be helpful to try a battery swap: take a battery from a functioning radio of the same type, and insert it into the malfunctioning radio. If this resolves the issue, changes are you need a new battery. If you have a bank of emergency radios, check their batteries on a monthly basis to make sure they're charged and the radios are working properly. Two-way Motorola radio accessories are a great way for radio users to engage in discrete communication, especially in noisy environments. If accessories such as remote speaker mics or two-way surveillance kits are not working properly, first try powering off the radio. Remove the accessory, resecure it, and turn on the radio. (Always follow these steps when attaching the accessory.) Does the radio register the accessory on its display when it's attached? Try turning off the radio, removing the accessory, and cleaning the contacts on the radio with a pencil eraser to take off any residue. After cleaning, with the radio still off, reattach the accessory and turn the radio back on. If this doesn't fix the problem, try turning off the radio and swapping in a new accessory — if that one registers, then it's most likely the accessory itself that's malfunctioning. Sometimes users face problems with two-way radios that are caused not by the device, but by how it's being used — or misused. Using radios correctly will solve a whole host of problems. Radios are meant to be intuitive, but they do require training, not just once but on an ongoing basis. Hold two-way radio two inches away from the mouth while speaking. Use good volume while speaking to make sure messages are heard. Press firmly on the PTT button until done speaking to guarantee messages are fully transmitted. Proper maintenance and storage can reduce the chances of damage to two-way radios, making them last as long as possible. Daily maintenance of the handset as well as good battery practices can also indirectly help with sound quality. With these tips for two-way radio maintenance, your communication will continue seamlessly for the estimated five to seven years that your radios are expected to last. Turn radios off when charging. Clean radios with a microfiber cloth and a little water. The cloth’s soft texture will wipe away dirt and smudges without damaging the unit. For more stubborn stains and marks, use a damp cloth and wipe until radios are clean. Don’t hold or grab radios by the antenna. Consistently using the antenna as a handle will eventually affect transmission and reception. Only use batteries and chargers that are compatible with the device. Once you’ve identified accessories designed and specified for your unit, keep them dry and only charge as needed. Overcharging batteries can decrease their lifespan. Turn off radios and remove batteries before storing. Do not store radios or batteries in active chargers. Store equipment in a dry and cool space with limited exposure to extreme weather conditions, such as excessive heat or cold, and the various elements of sunlight and water. Store radios and battery packs at a room temperature of 72° F.
If you’ve tried the troubleshooting steps above, and you’re sure your team is using their radios correctly, it’s time to make the call. While technology is changing, two-way radio service providers like Chicago Communications are equipped with the latest in technology to meet whatever challenge is thrown at us. From basic analog radio systems to the most advanced P25 Public Safety systems, we monitor and respond to service outages. We also consult on equipment with our contracts department to see whether it makes sense to put equipment on a contract or actively seek replacement because of age or parts issues. Contact Chicago Communications to request two way radio service for your facility.